Can be played with keyboard or a controller. Wow, #7, I'm flattered! Thanks to everyone that voted! Now that voting is over, I've fixed a few issues with the game, and now that I have time I also uploaded Mac and Linux builds! The original Windows build is still there for anyone that wants it. Jumping off a slope now rounds to the nearest tile. No more getting stuck halfway. Added a few missing ledges, to make getting stuck even harder. You deserve the first place of design. So I've been speedrunning this game a bit because I love it. So far my best time is 4:08, and I think I might be able to get under 4 minutes. If you wanna try and beat my time, I started the timer the moment I started moving, and ended it when I touched the escape pod. Anyways, if you're planning on updating the game, I found a few glitches. As people have already pointed out, you can softlock yourself in a few spots by jumping while halfway up a slope. I've also seen this glitch when jumping into a ledge: Not sure why this happens, but when I was about to get above (or I guess below) the ledge, it just teleported me to this height, trapping me. I've had it happen in a couple other locations, so I don't think it's this ledge specifically. On another note, the magnet is a little difficult to control sometimes, like when you're in a 1-block-wide gap:: For example. If I hold the magnet button and go left, which slope will I attach to? i don't have any control over that, which can make it a little annoying to try and get through the later areas quickly. Aside from that stuff, though, I really like this game. The level design is well done, especially considering that I was able to keep my bearings on my first playthrough even though all of the blocks look identical. 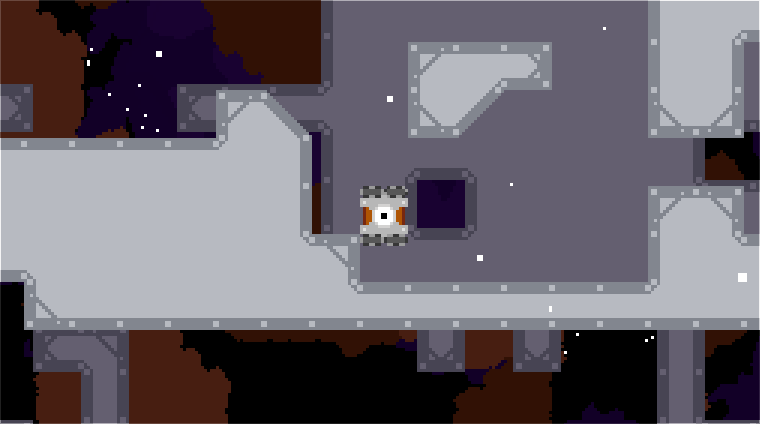 The mechanics make for some interesting puzzles, and since your vertical movement is so restricted, you have to try and find ways to get to a specific height so you can progress. The sections where you just fly through open space are great too. There's a bit of irony because even though you're not in an enclosed area, you're still stuck travelling in a straight line, and you can't go explore any of the things you see. I especially like that you can see the escape pod long before the end of the game, it's a nice touch. If you hit space you can switch witch side your magnets attach to. 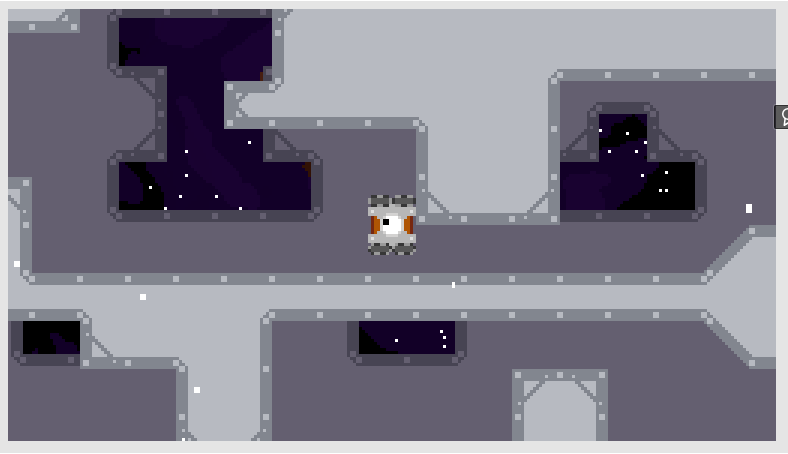 lots of games in this jam went with "Platforming without gravity," but you have executed it best. firstly, you knew exactly how to design the first jump to have the players expect an ordinary platformer. it gets me every time. secondly, you made the powerups so that they play with the no gravity idea rather than falling back on the tropes. Not to mention that the robot guy is really cute and he SQUINTS when going at high speeds! 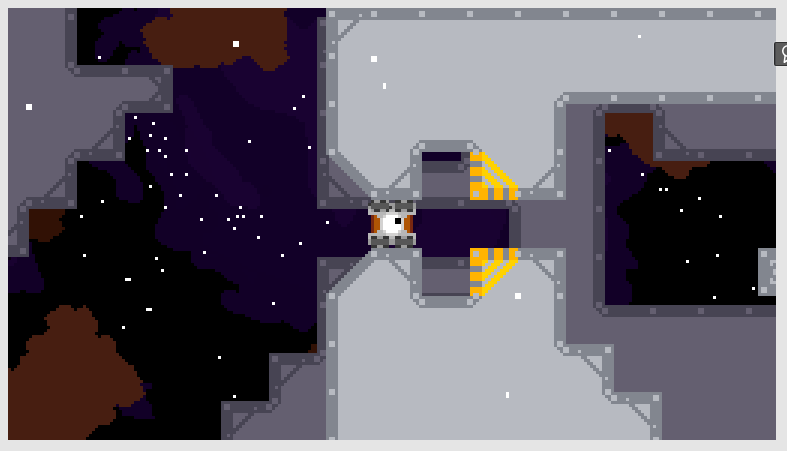 Also, I started the game and without any text but "Gravity Error Detected" I knew that the ship got blown up because of the tilesets and the backgrounds. Also the fact that you used the yellow paint stuff to tell the player that they could just jump off into space was genius. Overall, the controls were smooth and intuitive. I don't care who actually wins this jam. you, sir, have won it to me. Wow, thanks, I'm glad you liked it! Really nice mechanic, the game has a very good potential. The only things is I don't know where to go when I got the magnet. I'm going a bit on the right, then I'm back at the start of the level. And the game lack of difficulty! I mean ok I'm stuck but before that there was no difficulty to find my path. But I see there is a lot of work, and I had fun with thoses mechanics. I'm impressed by your work. I got stuck after the magnet when the robot misaligned itself after a jump, probably due to ramp. Also, I couldn't figure out where to go in that section. I was running around in circles. Actually, there are a lot of places you can get permastuck. Checkpoints would be a huge boon.